Are you one of the millions of people putting off your job search until the New Year? Well, that’s a myth, because we all know that business doesn’t just come to a screeching halt over the holidays. And, if companies need people with your specific superpowers to make business better, hiring doesn’t stop either. As a matter of fact, many hiring managers and recruiters say there’s more pressure before the end of the year to fill open positions, especially if an employer has a year-end “use-it-or-lose-it” deadline (i.e., if the position isn’t filled by December 31, it may be eliminated). So, an interview on Christmas Eve or on New Year’s Eve isn’t an unheard of concept. FACT: According to the U.S. Department of Labor, the total number of jobs filled in December 2014 was GREATER than the number filled in January 2015. With that in mind, you can bet that employers are fervently recruiting, interviewing, and hiring right-fit candidates—especially during the first couple of weeks of December 2015—before key personnel and hiring stakeholders take their holiday breaks. 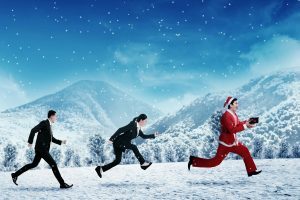 So, if you want to get ahead of the crowd this coming 2016 job search season and beat out the competition (who, by the way, are cozying up with egg nog and thinking the same you just were), it’s time for you to get yourself into a “move-it-or-lose-it” mindset. Use those holiday parties, social functions, and community events as a chance to build your network with friends, family, and colleagues as you’re searching for new job opportunities. It’s also a perfect time to practice your elevator pitch. Vis-à-vis networking, get online and make sure to update your LinkedIn profile and cultivate your online connections this season, too. Offer your help; you’ll be amazed how willing people are this time of year to return the favor and give back. As we end the year, reflect on the year’s accomplishments and update your resume accordingly. Why not include hiring managers, recruiters, business contacts, and companies that you’re targeting on your holiday card list? (And don’t forget to include your elevator pitch business card). For companies that do slow down over the holidays, use the downtime to follow up with employers and wish them a happy holiday season. In a more relaxed environment, you may break down some doors you weren’t able to before. Be patient, though; if they’re not in the office, build yourself a follow-up pipeline for after the holidays. Don’t forget to take a break, give yourself some personal time, then circle back to your job search with a fresh perspective. What it all comes down to is this: there’s no time like the present to double your job search efforts and give yourself the gift of a shiny new job this coming year!